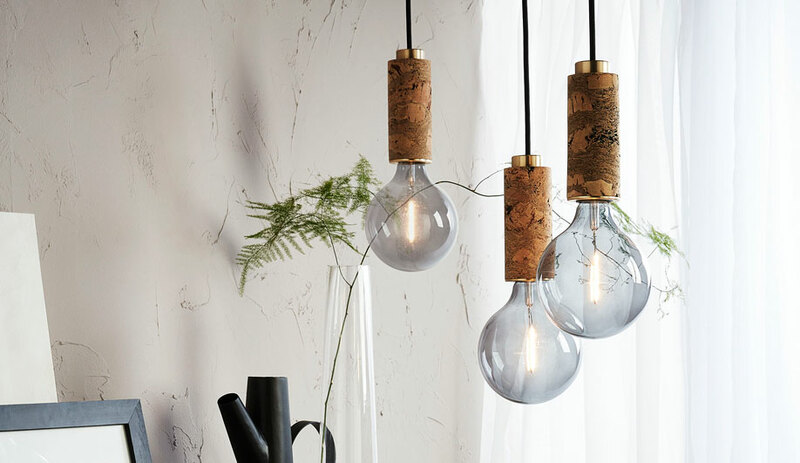 Azure brings you inside the Vancouver studio of Canada’s most original lighting manufacturer. One of the most striking front doors in Vancouver is found along a dusty stretch of sidewalk near Granville Island. On the entrance of a former printing factory, the intricate pattern – handcrafted from hundreds of Douglas fir offcuts and Lexan strips laminated together to crystalline effect – is nothing short of mesmerizing. At dusk, when light from within emits tantalizing winks through its translucent fragments, the whole building takes on an alluring glow. Thirty-six staffers, from the sales team to the glass-blowers, work at the Vancouver studio. Bocci also has two smaller offices in Berlin and London. enough to double as a casual seating area. On two walls of the spacious terrace, sliding glass doors tuck away in fine weather, letting staff enjoy the proximity to the outdoors while focusing on their laptops or seated at the various rows of white-painted metal desks. The remainder of the space contains a maze of rooms divided by towering bookcases. Left: A multi-coloured cluster from the 28 collection hangs above stacks of inventory. Orders are shipped from the studio within 24 hours. Right: Bocci’s eye-catching front door, designed by Arbel, is composed of Douglas fir offcuts and strips of Lexan laminated together. Since its launch in 2005, Bocci has become a multi-faceted company, also known for making an electrical socket that solves the problem of unsightly plates by nesting flush to the wall. Co-founder and creative director Omer Arbel, who studied architecture at the University of Waterloo, in Ontario, also designs houses and furniture, and in January the Monte Clark Gallery in Vancouver will showcase two of his art installations. 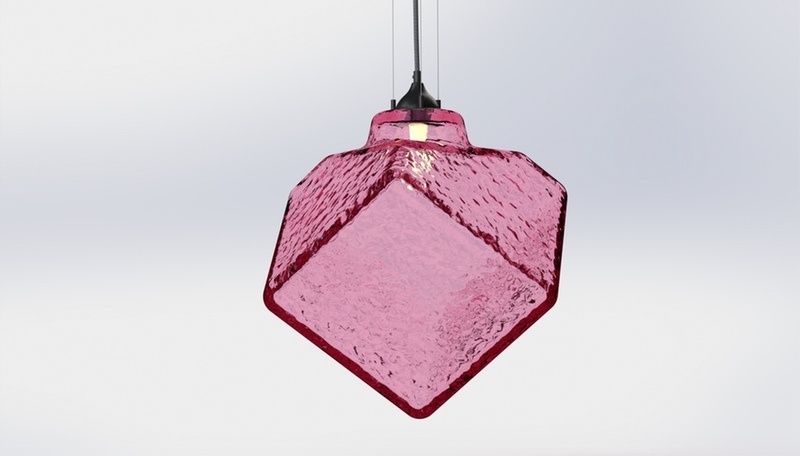 But it is the lighting collection that has made Bocci Design and Manufacturing Inc. a global phenomenon. It now lists five families of lights in its catalogue, with multiple variations and subcategories. The glass sphere – simply named 14 – that started the enterprise rolling almost a decade ago still sells well in some 500 showrooms worldwide. The collection, with the series numbered rather than named, includes such novel options as 38.16, a cluster of glass “moons” that double as planters for succulents and cacti. The electrical wiring, made of stiff copper tubing, is intended to hang in poetic tangles. Left: Experimentation is an essential component of Bocci’s business plan. The spherical 14 fixture, which launched the company nearly a decade ago, derived from an exploration of new glass-blowing techniques. Right: Artisans produce the lights in an open shed in the parking lot. Up to 15 pieces take shape during each eight-hour shift. 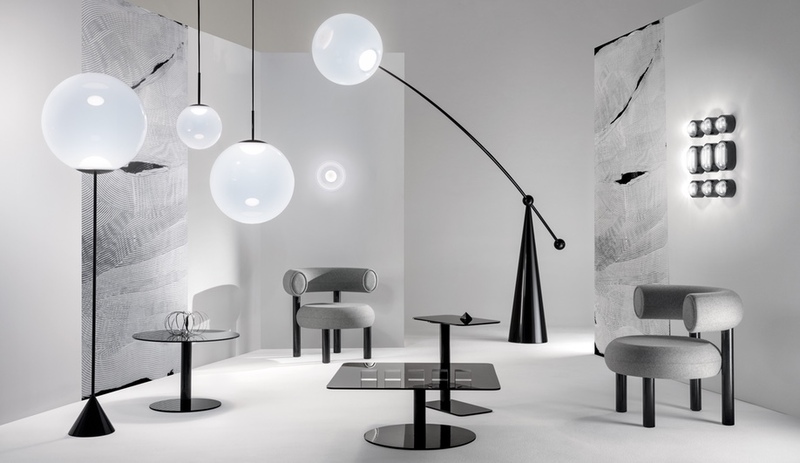 Part of the Bocci appeal is its ability to suit almost any environment, from an intimate powder room to corporate lobbies by Foster + Partners and Herzog & de Meuron; both firms are regular clients. During the London Design Festival this past fall, Arbel installed various chandeliers that seemed almost plant-like with their webs of wire entrails. The alien forms contrasted with the site inside London’s Ely House, which dates back to the 18th century. Left: A London plane tree grows on the top floor of the studio. It was craned into place after a roof section was carved out for the courtyard entrance. Right: At the London Design Festival in September, Arbel installed art-light assemblages at Ely House, built in 1722 and now occupied by Mallet Antiques. Bocci has also succeeded thanks to Arbel’s partner, Randy Bishop, who handles the financial side of the business and, smartly, gives Arbel freedom to explore. Both agree that their best move was to stay involved in the entire manufacturing cycle, and to form their operations around a community of designers, artisans and technicians. Of the 36 full-time staff, eight are glass-blowers who work from an open shed in the parking lot, where three furnaces are stoked 24 hours a day. During an eight-hour shift, the artisans craft between 12 and 15 pieces. After the fixtures are annealed, they are sent upstairs, and a dozen or so employees stand along a room-length table, wiring the electronic components, and boxing up the lights with a packaging system that suspends them inside the box – a critical step, to reduce the risk of damage during transit. An exterior stairway connects the building’s lower two levels, which house the contemporary furniture showroom Livingspace. According to Arbel, he and Bishop arrived at their integrated set-up by accident. Before Bocci launched, Arbel was doing what most young designers do: responding to manufacturers’ briefs. “I was working in splendid isolation,” he says jokingly. (He also felt desperate because no one was licensing his designs.) The 14 fixture arose from trial and error, which led to a unique method: when molten glass was ladled into a hemispheric cavity, a new, smaller orb appeared to float inside, like a candle inside a globe of water. Arbel says he recognized the technique’s potential almost immediately. “Something transcendent happened, and it wasn’t planned at all,” he says, “We discovered this amazing optical quality because we were building the light ourselves.” He and Bishop realized that a design-and-produce process could serve as the ideal engine for inspiration. Left: Bookcases filled with glass-blowing experiments double as room dividers. A pair of 28d lamps, in red and green, sit on bases coiled from their electrical cords. Right: Arbel (left) chats with a colleague. The original burgundy and tan walls of the top-floor courtyard have been overpainted in a blue terrazzo hue. Experimentation remains integral to Arbel’s practice, and he is quick to observe that young designers rarely get the chance to just explore materials. “They may be brilliant at form, but they are stuck delivering idealized computer renderings that the manufacturer must realize. Something is inevitably lost in the transition,” he says. As we talk and wander through the studio, it becomes evident that the rambling space is a physical expression of his creative mind. The floor of one room, which is sometimes used for conferences, is strewn with discarded prototypes that look like cancerous hunks of glass. Open shelves that reach to the ceiling display an odd selection of experimental works among stacks of architecture and design magazines. The half-full shelves act as semi-permeable barriers, allowing the eye to travel between rooms. Arbel considers their shoji-like filtering strategic: it insists that the production team talk to the design team, he says, and sales talks to production. Each station invites curiosity, and everyone has a sense of all aspects of the business.